Barcelona tourist office. Turisme de Barcelona. Barcelona tourist office locations and addresses. The Barcelona tourist offices are called Turisme de Barcelona. 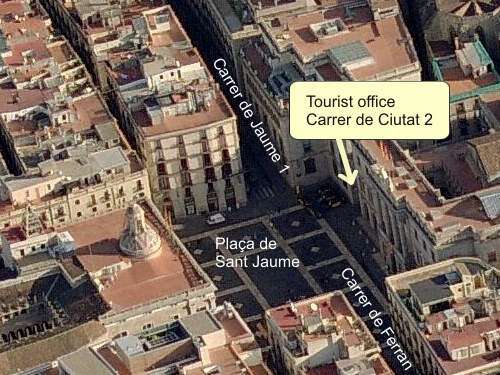 There are two central tourist offices and many tourist office cabins in Barcelona. You can get information, get maps, buy tours and exchange pre-booked vouchers at all Barcelona tourist offices and information cabins. Underground office on Plaza Catalunya. Open daily from 8.30am to 9pm. The biggest and most central Barcelona tourist information office is an underground office in the city centre in the corner of the the main square called 'Plaça de Catalunya.' Look for the tourist office signposts on the eastern corner of Plaza Catalunya (see photo diagram) where it meets the street called Avinguda del Portal de l'Àngel and then walk down the steps. This Tourist office can also process documentation for sales tax/VAT refund Global Blue Tax Free. Open daily from 8.30am to 9pm. Big tourist office on the square Plaça de Sant Jaume in the gothic area of Barcelona. Monday to Friday from 09.00- 20.00. Sunday and public holidays: 10.00 - 14.00. Cabina Plaça Espanya. Pl. Espanya / Maria Cristina Av. Cabina Sagrada Família. Pl. De la Sagrada Família. Cabina Sants. Pl. Joan Peiró, s/n. Cabina Plaça Catalunya Nord. Pl. De Catalunya, s/n. Cabina Plaça Catalunya Sud. Pl. De Catalunya, s/n.